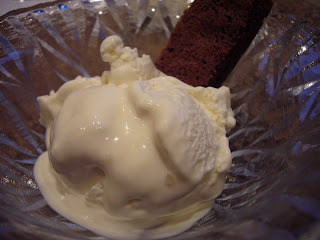 Today, Sabrina tried a new recipe from David Lebovitz's book, "The Perfect Scoop". She loves cheesecake, so why not try Cheesecake Ice Cream? It was a super quick and easy recipe to assemble. 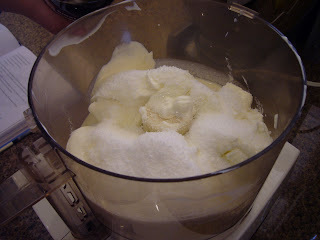 In the bowl of the food processor, she put in 8 ounces cream cheese, 1 cup sour cream, 1/2 cup cream, 2/3 cup sugar and 1 tsp vanilla. The original recipe called for lemon zest but she wanted vanilla instead. 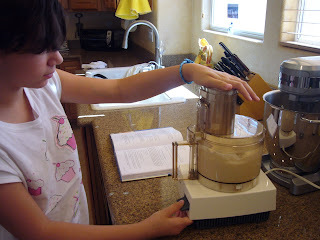 I don't know what it is about the food processor and kids, but they love using it! After the mixture was smooth, she transferred it to the refrigerator to chill for several hours. 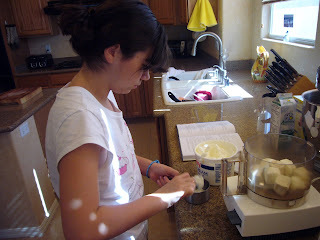 While Alexander was making dinner, she fired up the ice cream machine and poured the cold mixture in. It froze very quickly - so dessert was ready in no time! It tastes just like cheesecake! Smooth and creamy - but surprisingly, the kids didn't like it! Sabrina said, "I guess I prefer my cheesecake in a crust. But I will try another recipe from this book - there are so many to choose from!" Try baking a graham cracker crust and breaking it up into small pieces. You put it in the bottom of the bowl -or- even on top!